There are so-oooooo many beauty products out there, all advertising to deliver younger, smoother, brighter skin. You will find them on drugstore shelves, in expensive spas and salons, and in prescription form at the dermatologist's office. Not all products work. Everyone's skin is different and unique. But there are some beauty serums and creams that most dermatologists would agree, give you the best bet for a clear, smooth, firmer complexion. And one of these beauty products is Vitamin C serum. Simply put, topical Vitamin C in the form of Ascorbic Acid has been shown in a number of studies, to brighten skin, decrease the depth of wrinkles, and stimulate collagen. Vitamin C serum is a worthy beauty item to add to your anti-aging product arsenal, because it protects the skin from sun damage. And trust us, we could all use another weapon against the strong rays where we all like to sun in and play in. One important note: If you are a Retin-A or Renova user, do not use a retinoid and Vitamin C serum together. The two can clash. Instead, use the Vitamin C serum during the day, since you are exposed to the UV rays that time. And apply the Retin-A or Renova products at bedtime. Dermatologists suggest you use a Vitamin C serum with about a 10% Ascorbic Acid base or a little less. 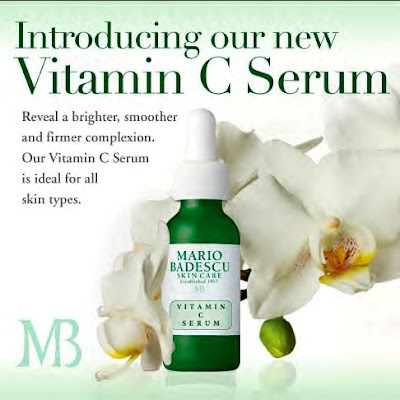 Today, we are talking about a new Mario Badescu beauty product: Vitamin C Serum ($45). This Vitamin C Serum contains 7.5% Ascorbic Acid (Vitamin C) to reduce discoloration and brighten skin. Formulated with Hyaluronic Acid to retain skin's natural moisture and Collagen to enhance skin's firmness and elasticity. Apply 3-4 drops on clean skin every other night. May be used under moisturizer or alone. Like we explained earlier, if using a retinoid, use Vitamin C serum at opposite times of the day. Otherwise, go ahead and apply the serum at night. By the way, if you enjoy using a night cream and don't want to give that up, then layer. The Vitamin C serum would go on first, and that would be followed by your favorite night cream. To learn more about Vitamin C serum, visit http://www.mariobadescu.com/. There is plenty of excellent information about skin care. Mario Badescu products are available at retail locations across the United States.